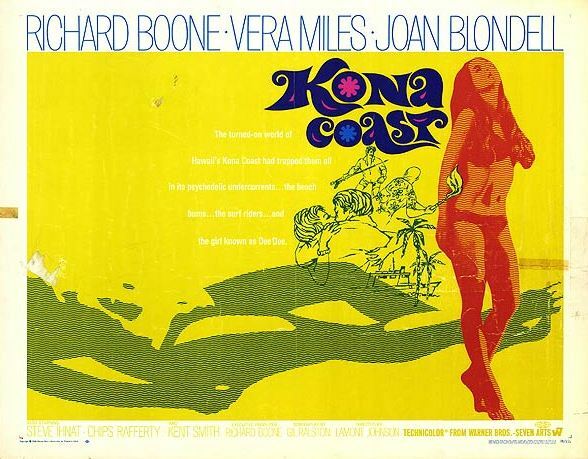 The Warner Archive is offering 1968's Kona Coast as a made-to-order DVD. I've never seen it, but based on the synopsis, I may just buy it unseen. Brace for an explosive story of violence and reprisal set against the stunning backdrop of the Hawaiian Isles. To avenge the death of his murdered daughter, charter boat captain Sam Moran (Richard Boone) becomes a one-man vigilante squad taking on the wealthy, drugged-up punk that killed her – and the rich and powerful that protect him. A memorable big-screen villain in hits like The War Lord, Hombre and Big Jake, Have Gun – Will Travel star Boone here plays an ordinary man pushed to extraordinary limits. Directed by two-time Emmy winner Lamont Johnson from a story by bestselling thriller writer John D. MacDonald (the source novelist of Cape Fear and A Flash of Green), Kona Coast co-stars Vera Miles, Joan Blondell, Kent Smith and Rock ’n’ Roll Hall of Famer Duane Eddy. Anyone seen this who wants to give me a recommendation? I mean, Duane Eddy plays a dude named Tiger Cat, so I'll probably get it even if you trash it, but I'm willing to hear opinions. Don't know if I would buy it sight unseen, but I would watch it.....although the copy is wrong, Boone is one of the heroes of 'Warlord'. And with Vera Miles and Joan Blondell you can't go wrong. I remember a florish of hawaiian themed stuff around this time. So probably worth a look, if it's on sale. Thanks, Tom! Maybe I'll see if I can find it on cable first. Yes, that movie use to be one of the staples of the old CBS Late night movies back in the day. Its a dated piece of tv thriller that's kinda like if an older, Travis McGee was done as an episode of Hawaii 5.0---hmmm, maybe I made that sound a lot more exciting than that was suppose to sound. Lol--nonetheless, its the great Richard Boone so if you're a fan of his---you'll look at it just for that. Speaking of The Warlord--Tom Floyd is correct that Boone is actually one of the "heroes" of that film, being Charlton Heston's faithful retainer. Boone is totally badass in his role and I wish somebody would finally do a DVD of that movie. Mike, the plot alone makes it worth your while...then Richard Boone? C'mon man? What're you waitin' for?